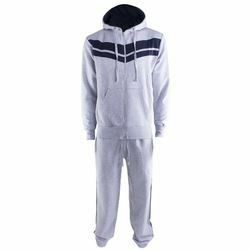 We provide a wide range of Track Suits in various sporty designs and sizes. Manufactured using cotton fabric, these tracksuits provide complete comfort and better air circulation. Our range is available in a variety of colors. These are also perfect for morning walks, sports and aerobic classes. In addition, the range is designed in compliance with latest trends and is offered at reasonable prices. Our tracksuits are available in full zipper, bordered and with inner.